Founded in 1895, Schwinn is an American icon, building some of the best-known and best-loved bicycles of all time. From its very beginning in Chicago, Illinois, the Schwinn mission has been to develop bicycles that allow people to experience the confidence and freedom that comes from riding a bike. 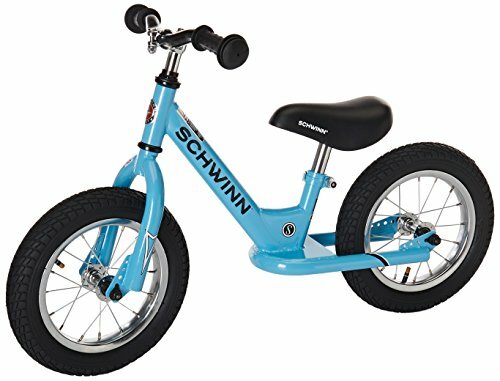 The Schwinn Stride Balance Bike is designed with a BMX look and a steel frame—its pedal-free, low center of gravity makes it easy to ride and perfect for young riders. With an adjustable, quick-release seat collar, this kid's bike is designed to grow with your little one as they learn to balance. The 12-inch spoked mag wheels are made with air-filled tires. A ball bearing headset allows for easy steering with chrome-finished handle bars. This kid's bike ships ready to be assembled. The wheels measure 12 inches. Designed for kids ages two to four.